When we started creating Liquid we focused purely on the virtues and advantages a pressure-cast process can offer. Structurally you can do things with casting that you can’t machine, such as full radiused compound curves, near zero-radius inside corners, and for precise fit and finish you can go back and machine the cast part in critical areas amplifying the best aspects of the process. We pushed back on other boundaries as well. 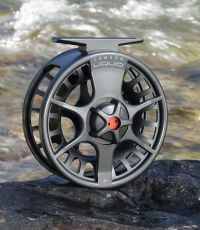 How much of a reel at this price can we make here in the U.S.? Quite a lot as it turns out, and it’s a good mix. These high quality castings are imported, but the components critical to the drag system are CNC-machined here in the U.S. Liquid reels are assembled in Boise alongside our highest priced reels. No other $100 reel can boast this much U.S. content and quality oversight. Add some color to your reel! These anodized color sleeves fit over the existing cassette; customization has never been this easy. Choose from three colors: burnt orange, coral blue and salsa green. Color sleeves retail for $9.95 and come in two sizes 1.5 or 2 reel and 3.5 or 4 reel.